Eggplant is the common name for a perennial plant, Solanum melongena, of the potato or nightshade family Solanaceae, characterized by large leaves, white to purple flowers with a five-lobed corolla and yellow stamens, and an ovoid fruit with numerous, small seeds. The name also is used for the fleshy, edible fruit of this plant, a botanical berry that is widely cultivated as a vegetable crop. The plant and fruit also are known as aubergine and brinjal. 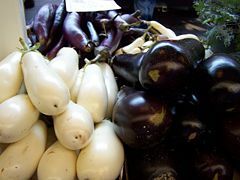 A variety of eggplant that is particularly prized in some regions, including the United States, is one with a large, cylindrical or egg-shaped fruit, with smooth, dark purple, glossy skin (Herbst 2001). However, human creativity has resulted in a wide variety of cultivars, varying in tastes, shapes, sizes, and colors. Depending on the cultivar, the fruit can vary from small to large and pendulous, from oblong to round, and might be such colors as green, white, or yellow, among others, or even striated shades and color gradients (Herbst 2001). As a nightshade, eggplant is closely related to the tomato and potato and is native to India and Sri Lanka. Eggplant provides a number of culinary values, offering a unique, rich, complex flavor when cooked and being used in cuisines from Japan to Spain. Its popularity and versatile use in Indian cuisine, including for both everyday and festive occasions, has led brinjal to be described as the "king of vegetables." The eggplant is a delicate perennial that often is cultivated as an annual. It grows 40 to 150 centimeters (16 to 57 inches) tall, with large coarsely lobed leaves that are 10 to 20 centimeters (4-8 inches) long and 5 to 10 centimeters (2-4 inches) broad. (Semi-)wild types can grow much larger, to 225 centimeters (7 feet) with large leaves over 30 centimeters (12 inches) long and 15 centimeters (6 inches) broad. The stem is often spiny. The flowers are white to purple, with a five-lobed corolla and yellow stamens. The fruit is fleshy, less than 3 centimeters in diameter on wild plants, but much larger in cultivated forms. The fruit is botanically classified as a berry. In botany, a true berry is a fruit in which the entire ovary wall ripens into an edible, relatively soft pericarp. The fruit of the eggplant contains numerous small, soft seeds, which are edible, but are bitter because they contain nicotinoid alkaloids, unsurprising in a close relative of tobacco. The most widely grown cultivated varieties (cultivars) in Europe and North America today are elongated ovoid, 12-25 centimeters long (4 1/2 to 9 inches) and 6-9 centimeters broad (2 to 4 inches) with a dark purple skin. A much wider range of shapes, sizes, and colors is grown in India and elsewhere in Asia. Larger varieties weighing up to a kilogram (2 pounds) grow in the region between the Ganges and Yamuna rivers, while smaller varieties are found elsewhere. Colors vary from white to yellow or green as well as reddish-purple and dark purple. Some cultivars have a color gradient, from white at the stem to bright pink to deep purple or even black. Green or purple cultivars with white striping also exist. 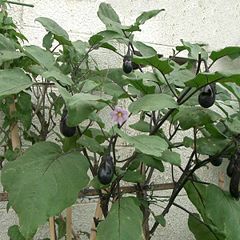 Chinese eggplants are commonly shaped like a narrower, slightly pendulous cucumber and sometimes were called Japanese eggplants in North America. Oval or elongated oval-shaped and black-skinned cultivars include 'Harris Special Hibush', 'Burpee Hybrid', 'Black Magic', 'Classic', 'Dusky', and 'Black Beauty'. Long, slim cultivars with purple-black skin include 'Little Fingers', 'Ichiban', 'Pingtung Long', and 'Tycoon'. Those with green skin include 'Louisiana Long Green' and 'Thai (Long) Green', while 'Dourga' is a white skin cultivar, and traditional, white-skinned, oval-shaped cultivars include 'Casper' and 'Easter Egg'. Bicolored cultivars with a color gradient include 'Rosa Bianca', and 'Violetta di Firenze'. Bicolored cultivars with striping include 'Listada de Gandia' and 'Udumalapet'. 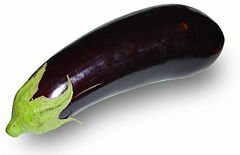 In some parts of India, miniature varieties of eggplants (most commonly called Vengan) are very popular. Eggplant is native to India (Tsao and Lo 2006; Doijode 2001). It has been cultivated in southern and eastern Asia since prehistory but appears to have become known to the Western world no earlier than ca. 1500 C.E.. The first known written record of the eggplant is found in Qí mín yào shù, an ancient Chinese agricultural treatise completed in 544 C.E. (Dunlop 2006). The numerous Arabic and North African names for it, along with the lack of ancient Greek and Roman names, indicate that it was introduced throughout the Mediterranean area by the Arabs in the early Middle Ages. The scientific name Solanum melongena is derived from a sixteenth-century Arabic term for one kind of eggplant. The name eggplant developed in the United States, Australia, New Zealand, and Canada because the fruits of some eighteenth century European cultivars were yellow or white and resembled goose or hen's eggs. The name aubergine in British English developed based on the French aubergine (as derived from Catalan albergínia, from Arabic al-badinjan, from Persian badin-gan, from Sanskrit vatin-ganah.). In Indian and South African English, the fruit is known as a "brinjal." Aubergine and brinjal, with their distinctive br-jn or brn-jl aspects, derive from Arabic and Sanskrit. In the Caribbean island of Trinidad, it also goes by the Latin derivative "melongen." 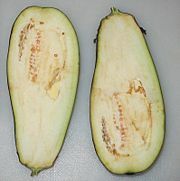 A purple eggplant which has been sliced in half, showing the inside. The flesh surrounding the seeds is already beginning to oxidize and will turn brown just minutes after slicing. In tropical and subtropical climates, the eggplant can be sown directly into the garden. Eggplant grown in temperate climates fares better when transplanted into the garden after all danger of frost is past. Seeds are typically started eight to ten weeks prior to the anticipated frost-free date. Many pests and diseases that afflict other solanaceous vegetables, such as tomato, pepper (capsicum), and potato, are also troublesome to eggplants. For this reason, it should not be planted in areas previously occupied by its close relatives. Four years ideally should separate successive crops of eggplants. Common North American pests include the potato beetle, flea beetle, aphids, and spider mites. Many of these can be controlled using Bacillus thuringiensis (Bt), a bacterium that attacks the soft-bodied larvae. (Adults can be removed by hand, though flea beetles can be especially difficult to control.) Good sanitation and crop-rotation practices are extremely important for controlling fungal disease, the most serious of which is Verticillium. Spacing generally should be 45 centimeters (18 inches) to 60 centimeters (24 inches) between plants, depending on cultivar, and 60 centimeters to 90 centimeters (24 to 36 inches) between rows, depending on the type of cultivation equipment being used. Mulching will help conserve moisture and prevent weeds and fungal diseases. The flowers are relatively unattractive to bees and the first blossoms often do not set fruit. Hand pollination will improve the set of the first blossoms. Fruits are typically cut from the vine just above the calyx owing to the semi-woody stems. Production of eggplant is highly concentrated, with 90 percent of output coming from five countries in 2010. China is the top producer (58 percent of world output) and India is second (25 percent), followed by Egypt, Iran and Turkey. More than 4,000,000 acres (1,600,000 hectares) are devoted to the cultivation of eggplant in the world (Food And Agricultural Organization of United Nations 2010). Melanzane alla Parmigiana, or Eggplant Parmesan (baked with Parmesan cheese). The raw fruit can have a somewhat bitter taste, but becomes tender when cooked and develops a rich, complex flavor. Salting and then rinsing the sliced eggplant (known as "degorging") can soften and remove much of the bitterness. Some modern varieties do not need this treatment, as they are less bitter. The eggplant is capable of absorbing large amounts of cooking fats and sauces, allowing for very rich dishes, but the salting process will reduce the amount of oil absorbed. The fruit flesh is smooth; as in the related tomato, the numerous seeds are soft and edible along with the rest of the fruit. The thin skin is also edible, so that the eggplant need not be peeled. The eggplant is used in cuisines from Japan to Spain. It is often stewed, as in the French ratatouille, the Italian melanzane alla parmigiana, the Greek moussaka, and Middle-Eastern and South Asian dishes. It may also be roasted in its skin until charred, so that the pulp can be removed and blended with other ingredients such as lemon, tahini, and garlic, as in the Middle Eastern dish baba ghanoush and the similar Greek dish melitzanosalata or the Indian dishes of Baigan Bhartha or Gojju. It can be sliced, battered, and deep-fried, then served with various sauces, which may be based on yogurt, tahini, or tamarind. Grilled and mashed eggplant mixed with onions, tomatoes, and spices makes the Indian dish baingan ka bhartha. The eggplant can also be stuffed with meat, rice, or other fillings and then baked. In the Caucasus, for example, it is fried and stuffed with walnut paste to make nigvziani badrijani. The eggplant or aubergine is widely used in Indian cuisine where it is called brinjal, and is considered the "King of Vegetables"
As a native plant, it is widely used in Indian cuisine, for example in sambhar, chutney, curries, and achaar. Owing to its versatile nature and wide use in both everyday and festive Indian food, it is often described (under the name brinjal) as the "King of Vegetables." In one dish, Brinjal is stuffed with ground coconut, peanuts, and masala and then cooked in oil. Eggplant has some medicinal value. It can block the formation of free radicals, help control cholesterol levels, and is also a source of folic acid and potassium (Health24). Studies of the Institute of Biology of São Paulo State University, Brazil (Instituto de Biociências of the UNESP de Botucatu, São Paulo) showed that eggplant is effective in the treatment of high blood cholesterol hypercholesterolemia. Because of the eggplant's relationship with the Solanaceae (nightshade) family, it was at one time believed to be poisonous. While it is true that eggplant can generally be eaten without ill effect by most people, for some the eating of eggplant, as well as other edible nightshade plants (tomato, potato, and capsicum/peppers), can indeed be harmful. Some eggplants can be rather bitter, which can irritate the stomach lining and cause gastritis. Some sources, particularly in the natural health community, state that nightshades, including eggplant, can cause or significantly worsen arthritis and should be avoided by those sensitive to them (Childers and Margoles 1993). Eggplant is richer in nicotine than any other edible plant, with a concentration of 100 ng/g (or 0.01mg/100g). However, the amount of nicotine from eggplant or any other food is negligible compared to passive smoking (Domino et al. 1993). The fruit of the Thai eggplant. The white residue on the leaves is common. Childers, N. F., and M. S. Margoles. 1993. An apparent relation of nightshades (Solanaceae) to arthritis. Journal of Neurological and Orthopedic Medical Surgery 12: 227-231. Retrieved May 26, 2008. Doijode, S. D. 2001. Seed Storage of Horticultural Crops. Haworth Press: ISBN 1560229012. Domino, E. F., E. Hornbach, and T. Demana. 1993. The nicotine content of common vegetables. New England Journal of Medicine 329:437. Retrieved May 26, 2008. Dunlop, F. 2006. Revolutionary Chinese Cookbook: Recipes from Hunan Province. Ebury Press. ISBN 0393062228. Food And Agricultural Organization of United Nations. 2010. The Statistical Division. Retrieved January 23, 2013. Health24. 2008. Aubergine. Health24.com. Retrieved May 26, 2008. Tsao and Lo. 2006. In Y. Hui, Handbook of Food Science, Technology, and Engineering. Boca Raton: Taylor & Francis. ISBN 1574445510. United States Department of Agriculture (USDA), Economic Research Service. 2006. Vegetables and melons outlook/VGS-318. United States Department of Agriculture. Retrieved April 24, 2007. All links retrieved September 20, 2017. Solanum melongena L. - Aubergine– Plants for a Future. 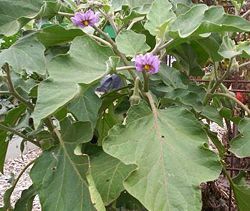 Solanum melongena L. on Solanaceae Source – Images, specimens and a full list of scientific synonyms previously used to refer to the eggplant. This page was last modified on 20 September 2017, at 19:59.